NO MEETING because of Memorial Day Holiday week! 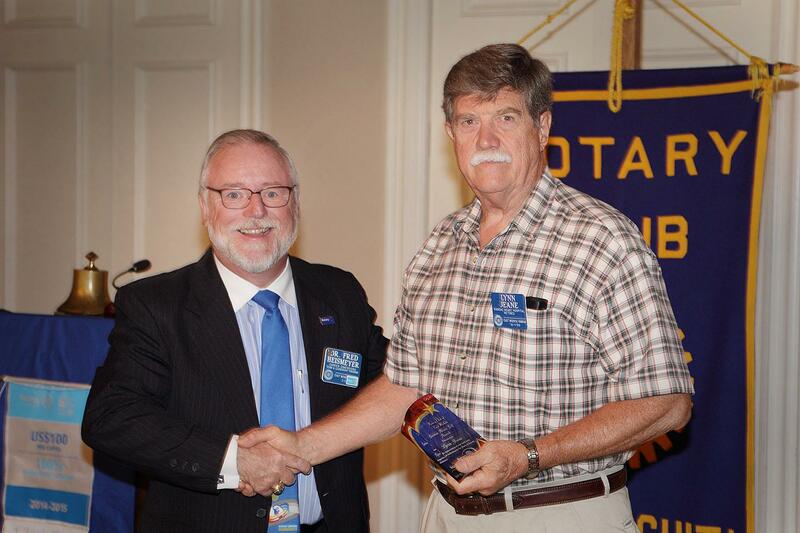 and weekly newsletter, "ROTARY NOTARY"
NO MEETING - because of Memorial Day holiday week! March Madness has concluded with Virginia winning it all on April 8th's championship game! With your participation, together(!) our 2nd Annual “Battle of the Brackets” raised $1,400 for the East Wichita Rotary Foundation, surpassing last year’s inaugural fundraiser total of $1,250! Many thanks to each of you for endorsing this fundraiser for our Foundation, which provides scholarships to local area high school students. 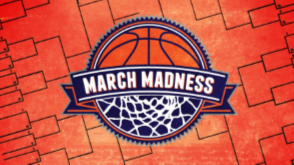 Your participation, with the purchase of a bracket or two or a contribution “to the cause”, will provide OVER ONE scholarship, for $1000/year, for a deserving student! Great teamwork, folks! Tony Hurtig, the husband of our EWR Club Executive, won the $100 prize for the winning bracket. Boy, there was lots of teasing at the meeting when the bracket winner was announced, especially after our Club Executive won last year. As Kim said, "Trust me! We Hurtig’s aren’t lucky in anything else, except perhaps doing brackets." At our April 10 Rotary meeting, we also had a drawing for $50 each from two of the non-winning brackets and ….. drum roll please ….Michael Moeder and Michael Caffrey (pictured left to right, below) each won $50. Must be a lucky “Michael-thing” going on there! 😊 Just a little tidbit: Michael Caffrey is a very new member AND it was his additional raffle chance, not his bracket, that won. Very cool! Hope to see you all next year when we "take on the Madness and battle the brackets" again! 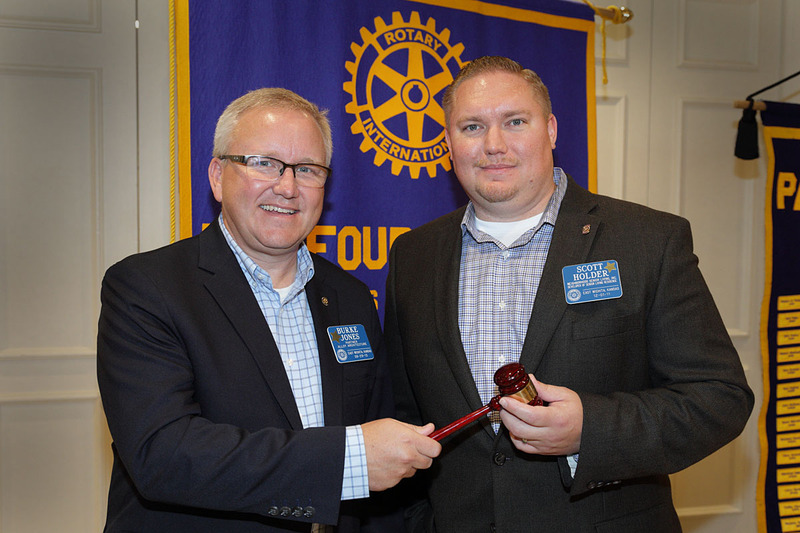 .....as Scott Holder passes the gavel to Burke Jones! As always, the "Changing of the Guard" meeting is a Club favorite! This year's was no different, thanks to a fantastically funny "roast" of Scott by Burke. But first, we looked back at highlights of this last year, including installing benches, via a District grant, in Eastview park, putting a mentorship program in place for new members, hosting a "March Madness Battle of the Brackets" to benefit our own Foundation, and welcoming 13 new members. 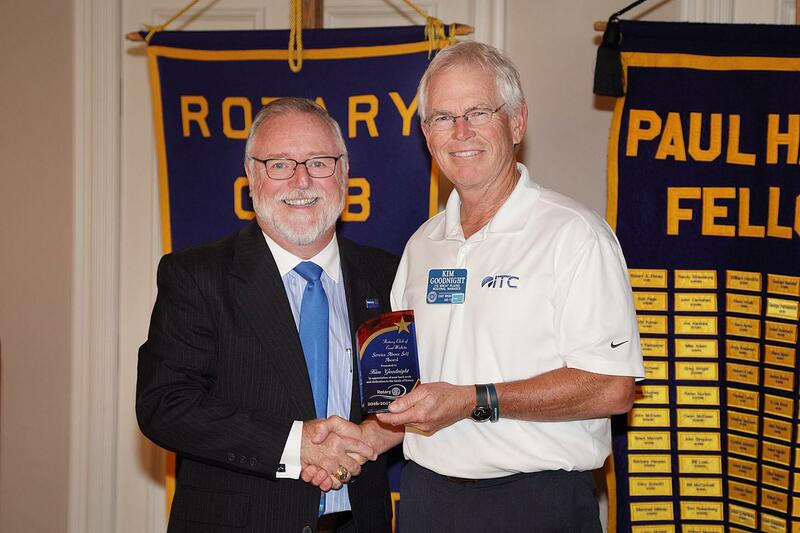 Many thanks to Scott Holder, "our fearless leader" for all of the energy and leadership he shared with our Club this year; he was the consummate "team player"! Good luck to Burke as he leads us for 2018-19! 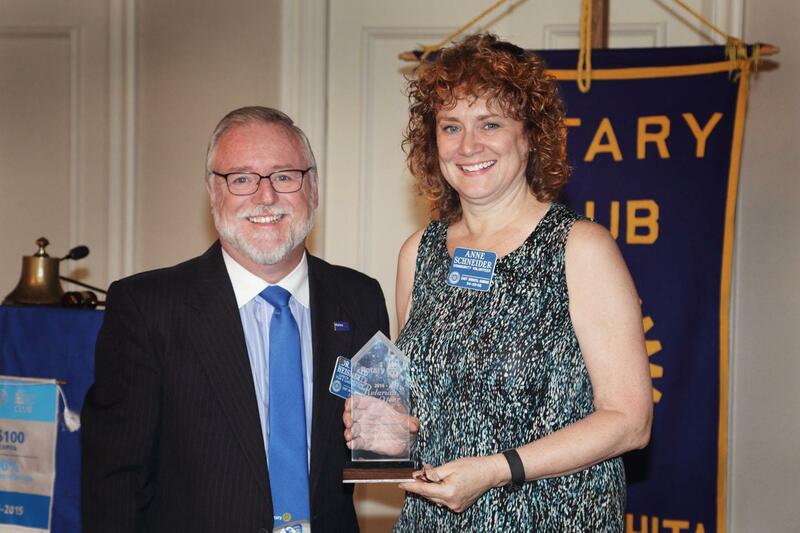 Congratulations, too, go out to Denise Hearson and Tammie Rhea, named the recipients of the "Service Above Self" and "Rotarian of the Year" award, respectively. Scott also recognized and thanked his board members and our own Foundation's board members. The meeting was well attended, and fun was had by all! What a year it's been, EWR! 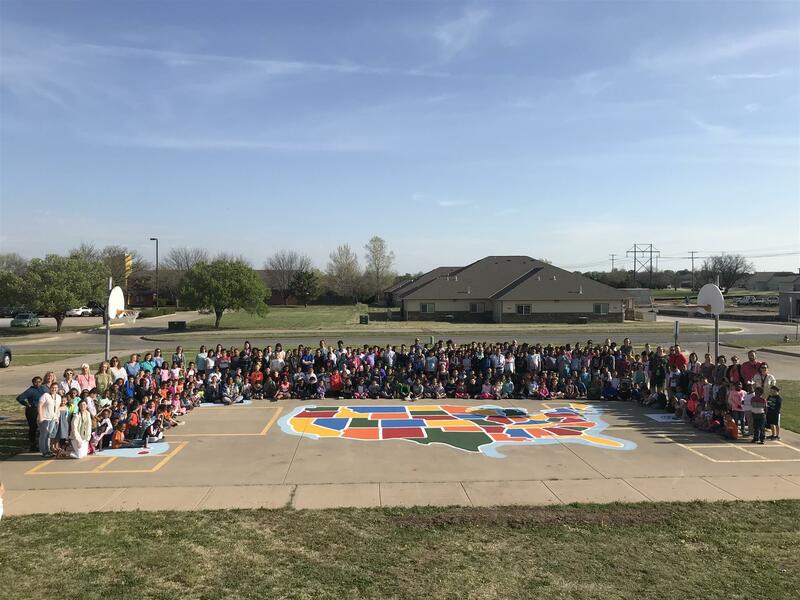 On April 28, a group of East Wichita Rotarians, joined by a few WSU international students, painted the fourth school map by our Club, this one at Gammon Elementary. 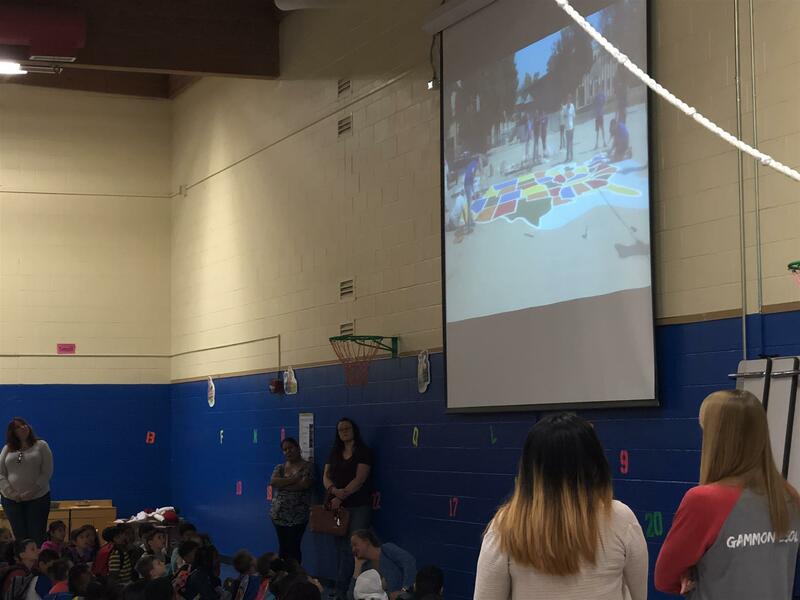 What a fun surprise to the Gammon students, as evident in the pictures below, as they arrived at school on Monday to discover their new learning tool and then gathered outside on the map to celebrate this colorful US map! Can you find Kansas?? Annual EWR Christmas Party was a smashing success! There was nothing unlucky about the number 13 for this year's annual EWR Christmas Party. On December 13, a record number of Rotarians and their spouses/guests came together for a night of great food, fun friendships and holiday festiveness like never before, with the beautifully-decorated backdrop of the Wichita Country Club as our host. Adding to the success of the evening was this year's entertainment: professional ventriloquist, Greg Claassen! He had the group laughing so much we were crying! Not sure how we top this evening but I know all of us who were there felt very "December-13th-lucky" to have been a part of such a wonderful Christmas party! If the smiles in the pictures (click here) are any indication, fun was had by all! Merry Christmas from East Wichita Rotary and have a very prosperous, healthy 2018, full of love and family! EWR Volunteers join WCH residents to decorate Christmas trees! With decorations aplenty and lots of good cheer, to boot, East Wichita Rotarians and friends helped the residents of Wichita Children's Home decorate Christmas trees! What a fantastic way to enjoy a Saturday morning in December, one of the great annual traditions of EWR! District Grant used for beautiful new park benches! With the help of a District grant, matching funds from our Club and a great partnership with the City of Wichita Parks and Recreation Department, new benches replaced old worn out benches in Eastview Park at E. 13th and Governour. The new benches are even Rotary blue! Several of our members gathered to assemble the benches and "get their hands a little dirty" to make this project a reality. Many thanks to the District for awarding the grant and to the City for their help also. Click here to see a photo album showing the transformation from the old ... to the new! Voila! .....from Fred Heismeyer to Scott Holder! As always, the "Changing of the Guard" meeting is a Club favorite! This year's was no different, interlaced with humor and tributes as Fred Heismeyer passed the gavel to Scott Holder. Fred was so good to bring us many fresh ideas and always kept us informed of club matters, as well as District and International matters. In fact, the title of this article was introduced by Fred. He shared with us that, when visiting a Rotary club in Russia, that club calls the process of changing leadership as "turning the wheel". Many thanks to Fred Heismeyer, "our fearless leader" for all of the energy and leadership he shared with our Club this year and good luck to Scott as he leads us for 2017-18! Congratulations, too, go out to Kim Goodnight and Lynn Jeane, each presented with the "Service Above Self" award and Anne Schneider, awarded "Rotarian of the Year". Fred also recognized and thanked his board members and our own Foundation's board members. The meeting concluded with a wonderfully funny slide show, put together by Scott, "roasting" Fred. Rotary International has really encouraged all of the clubs worldwide to visit the issue of new membership categories, giving clubs autonomy to structure their membership statuses as they see fit for their Club. As such, with the start of a new Rotary year just around the corner on July 1, the Board of Directors has been hard at work discussing and brainstorming new membership categories for our Club. • 12 Meals included (one per month) – meals in addition to the 12 would be pay-as-you-go at our standard rate. • Required minimum 50% involvement among meeting attendance, service projects and mixers – combined. This is a fantastic way for a young professional building his/her career, with perhaps increased demands on one's time, to have an affordable way to join and grow with Rotary! Contact any of the directors on the left side of the website for more details! Also, there is a section on the application to indicate if this is the membership category for which you are applying. Please note that this is an evolving program and subject to change or elimination in the future. It is said you cannot say “THANK YOU” enough to your team. I cannot agree more. 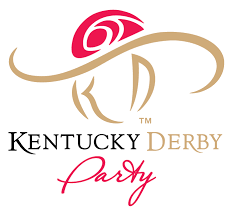 So, a big THANK YOU goes to the Fundraising team for a fabulous job on conceptualizing, organizing, creating and executing our Kentucky Derby event. From the wonderful venue, classy decorations, great food/drinks, fun themed games, excellent items for the auctions/drawings and, of course, the live streaming of the 2017 "Run for the Roses," the team of East Wichita Rotarians gave our Club the opportunity to raise $10,500 to be equally divided by Starkey, EmberHope and Heartspring. Each of these organizations works with children/youth to improve their living conditions. We congratulate the entire team for its collective effort and success, as well as each Rotarian for their individual role on the Fundraising committee: Kim Goodnight (Chair), Susan Addington, Brian Blackerby, Mick Cayless, Ryan Henry, Kim Hurtig, Tammie Rhea, and Isaac Ulbrich. We also thank Anne Schneider and Ric Wolford for taking pictures, and Eileen Kludt and Burke Jones for their special assistance. Thanks, too, to the staffs of the LUX Building, Larkspur Restaurant and Flying Monkey Photo Booth for their roles in making this event fun and a success. We should also give a big shout-out and thank you to our corporate sponsors of Westar Energy, Intrust Bank and ITC Great Plains. Of course, many individuals and organizations donated items for the auction/raffle and we want to thank each for their part in helping us raise money for our three recipient organizations. Finally, thanks to everyone who attended. 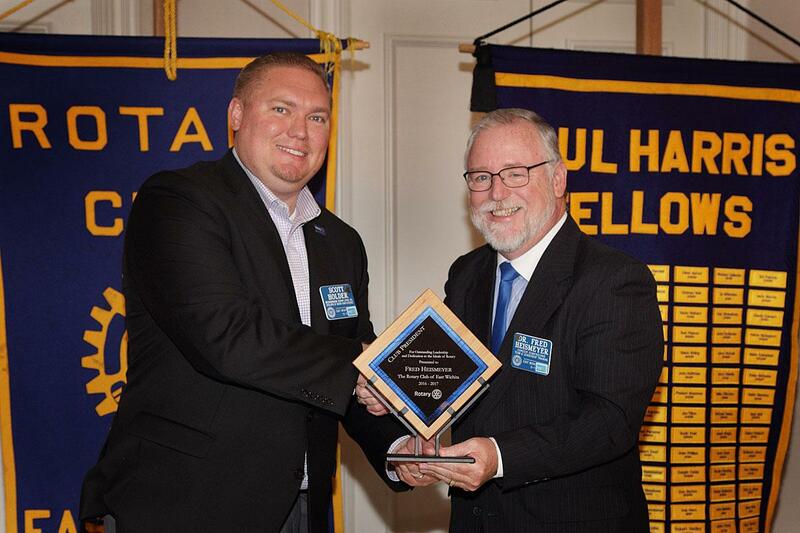 We expanded our audience to include East Wichita Rotarians and many guests,thus widening the Rotary story to our community.